Back in 1957 or so, they wrote that Paris, Texas was known as "The North Star of Texas" and was even the subject of a later song by a famous country duo by the name of George and Tammy. 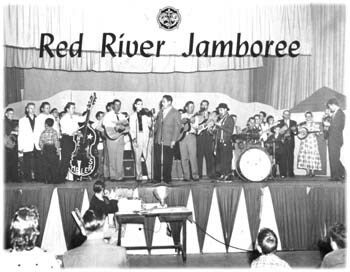 But back then, Paris was also host to the Red River Jamboree, which took place each Saturday night from 8:00 to 11:00pm. It was held over at the Fair Park Coliseum. And such was its popularity, that there was a two hour matinee or "prevue" from 2:00 to 4:00pm each Saturday afternoon. It's unclear from the article we have in the December 1957 Cowboy Songs magazine whether it was the night or afternoon shows that were broadcast via remote over KFTV. The producer of the Red River Jamboree was Roy Glenn, who also doubled up as banjoist and comedian. The fellow handling the emcee duties was KFTV DJ, Pee Wee Reid. The show was started by Pee Wee and Roy. Pee Wee was a Native American and said to be a colorful character. He played bass and had his own dance band that played in the Dallas, Texas area in the late 1940s. Let's take a look at the Jamboree cast. The show may have been unusual in that the headliner was a 16-year old gal by the name of Nan Castle, an RCA Victor artist back then. She had appeared on June 24th (1957?) on the Arthur Godfrey Talent Scout TV Show from New York. Around that time, her current release was "Starlight, Starbright" and "I'm Not Ashamed". Her real name was Nancy Castleberry, but it was shortened after she started getting national attention. 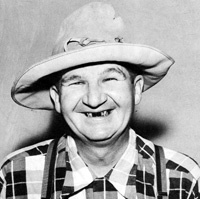 Joining the cast in May of 1957 was a veteran comedian and songwriter, Bob Shelton, who was also known as "The Hopkins County Firecracker". 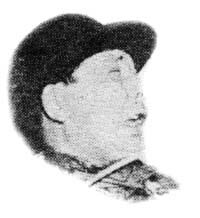 Bob was formerly a part of the great Shelton Brothers act with his brother Joe. They recorded for the Bluebird label and later the Decca label. They enjoyed some bit of success in the early days of country music history. 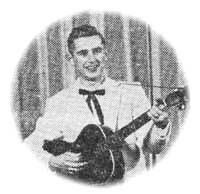 William Harris and the Ramblers were the most popular rockabilly act in Northeast Texas back then. They had two groups of brothers in the band, William and Otis Harris and Dean and Ray Martin. Another group was the Musical Keeners, which was a family act consisting of the father, Clinton, son, Glenn David and daughter, Yvonne. They also provided much of the musical backing for other performers on the Red River Jamboree. Johnny Case writes us and tell us of some of the other folks that were a part of what some term the "house band". Clinton Keener and J.C. Case would play rhythm guitar. 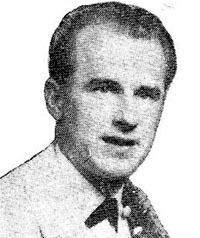 Gleen Keener and Jerry Case (son of J.C. Case) were the lead guitarists. Playing the fiddle would be Pee Wee Alharton and Lloyd Ferguson. Jimmy Don Brown or Pee Wee Reid would be on the bass. Roy Glenn would play tenor banjo while Jack Beard or Louis Ingrham would be on the drums. The show did quite a bit of promotion in the local Paris newspapers as you can see. In 1956, they were promoting a big show on Thursday evening, October 18, 1956 at 7:30pm that was to be held at the South Side Plaza in dowtown Paris for an event that was sponsored by the Paris Merchants as an "Appreciation Event". In the days leading up to the event, "The Paris News" was running feature articles on the upcoming appearances of various artists at the gala event. 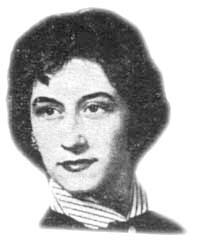 On the front page of the October 16, 1956 issue, was Nancy Castleberry of Cooper, Texas, (who later was billed as Nan Castle) along with many of the other musicians such as her father, Paul Castleberry, J.C. Case, Johnny Case and Jerry Case. 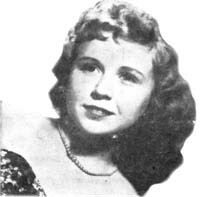 Riley Crabtree was also to appear and just had a song recorded by Kitty Wells at the time that was pending release. Bob and Joe Shelton, the Shelton Brothers were also set to appear on the show; they were from the area, Reilly Springs. Bob was the comedian of the group, they said he would size up the audience before going on stage so he could decided whether to wear shoes or go barefooted. J.C. Case was to appear with his two sons, Jerry and Johnny. Jerry's guitar playing at the age of 11 was something to behold. He was featured in an undated article of the Fort Worth Star Telegram that told of his meeting Ernest Tubb and Mrs. Jimmie Rodgers when they were both in town for the Red River Exposition one year. He got so fascinated by his guests that he started tinkering with the guitar, learning by ear as he went. 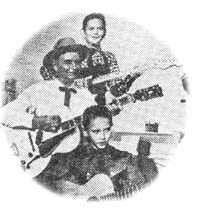 His talent was such that they said he was the "...youngest instructor giving guitar lessons in Texas." William Harris and his Ramblers were set to play the big event, too. They were a rockabilly group from the Talco and Mt. Pleasant area. William was all of 18 years old at the time and his brother was 14 and playing the electric takeoff guitar with the group. They were also backing up Riley Crabtree on many of his stage appearances at that time. The October 1956 event was to also include some mean fiddle playing by Benny Thompson, of Arlington, TX who was "World's Champion Fiddler" along with Louis Franklin, from Whiteright, TX who was also a champion fiddle player. 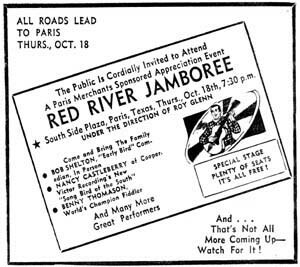 Before we end this writeup on the Red River Jamboree, it would be appropriate to include the story behind the origins of the Red River Jamboree as related by Johnny Case. As we mentioned above, Pee Wee Reid and Roy Glenn started the show. A few years ago, Johnny Case and his friend Kevin Coffey went to Paris, Texas so Kevin could interview Pee Wee. Johnny told us Kevin asked him why he had started the Red River Jamboree. Without any hesitation, Pee Wee replied, "I did it for those kids." I wanted those kids to have a chance to perform and get some stage experience." And there's no doubt there were a lot of talented youngsters in and around Paris in the mid-1950s and many have Pee Wee Reid to thank for giving them a start. Hillbilly-Music.com wishes to express its appreciation to Johnny Case of "The Cases" for his recollections, cast photo, anecdotes and articles about this show. His father was J.C. Case, a veteran musician who played on radio, television and jamboree shows in Northeast Texas. His mom was Floy Case, who was acknowledged by the Country Music Foundation as one of the pioneer country music journalists in 1983.